The Pacific Encrusting Gorgonian is one of the most adaptable corals, easy to care for and propagate! The Pacific Encrusting Gorgonian Briareum stechei is a very hardy and durable gorgonian. The tissue of its mat is a pale tan adorned with "furry" green polyps. The mat can be smooth, or on some specimens can have bulbous or slightly raised calyces (bumps) where the polyps reside. The polyps extending out of the calyces look like long, feathery, grass-like tentacles. It is very robust and will eagerly encrust other living corals, especially other gorgonians. The Briareum species are found in both the Pacific and Atlantic Oceans. They are very common in nature, found in waters that are just a few inches deep to depths of 100 feet (30 m). They primarily form an unbranched, encrusting coral with a low profile stolon, or mat. The tissue of the mat is a gray, tan, or a shade of purple. Some species also have an erect growth and will sparsely form thick, short upright stalks or lobes from the mat. The Corky Sea Finger Briareum asbestinum from the Atlantic, is one such specimen that can form finger-like protrusions. The tentacles of the Pacific Encrusting Gorgonian are usually green and are generally extended, but they can fully retract into the mat if disturbed. It has more green coloring in the polyps than its cousin, the Corky Sea Finger, yet its rind is a lighter tan color while the Corky Sea Finger is purple to pale gray, or yellowish brown. Other common names it is known by are Star Polyp and Green Encrusting Octosoft. The Pacific Encrusting Gorgonian resembles the True Star Polyps of the Pachyclavularia genera, with a well known example being the Green Star Polyps Pachyclavularia (Briareum) violacea. Some experts treat these two genera as synonymous though the Pachyclavularia genera appears to have important identifying differences. The Pachyclavularia is generally distinguished by a brighter purple to reddish color mat and very green, yellow or light green tentacles. Unlike the Pachyclavularia genus, the Briareum species can also shed a mucus "sheet." This species is a great beginners coral and a wonderful candidate for those who want to try propagation techniques. The Pacific Encrusting Gorgonian is very easy to care for with its only requirement being a moderate to strong, and turbulent, water flow. Most light is acceptable, although it will grow faster with higher light levels. This coral is very robust, however, and will eagerly encrust other living corals, especially other gorgonians. It may be helpful to keep the colony on a rock that isn’t connected to any of the rock work. The Pacific Encrusting Gorgonian Briareum stechei was described by Kükenthal in 1908. Other common names this species is known by are Star Polyp and Green Encrusting Octosoft. The Briareum genus was described by de Blainville in 1834. There are about 7 species in this genus including Corky Sea Finger B. asbestinum (Pallas, 1766), B. contortum (Kükenthal, 1906), B. excavata (Nutting, 1911), B. hamrum (Gohar, 1948), B. palmachristi (Duchassaing & Michelotti, 1860), Pacific Encrusting Gorgonian B. stechei (Kükenthal, 1908), and B. violaceum (Quoy & Gaimard, 1833). The Briareum corals are found in both the Atlantic and Pacific Oceans. They are very common, found on all reef areas, and are not on the IUCN Red List for Endangered Species. These corals inhabit depths from 3 to 131 feet (1 - 40). The waters vary, having strong or weak water movement. The waters can also be very clean or very nutrient rich, and they can have varying amounts of lighting. Some common names the Atlantic species are known by are Encrusting Gorgonian and Briareum, while Pacific species are known by Pacific Encrusting Gorgonian and Star Polyps. These are soft corals in the Class Anthozoa, Subclass Octocorallia, and Order Alcyonacea. They are currently classified as a gorgonian under the Suborder Scleraxonia, which have fused sclerites in their core and rind. The Briareum genus is further placed in the Briareidae family. This family originally had just this single genus, but has been recently revised to include two additional genera, Lignopsis (Perez & Zamponi, 2000) and Pseudosuberia (Kükenthal, 1919), each if which have just a single species. Pacific species of Briareum corals are often confused with the true Star Polyps of the Pachyclavularia genus. A well known example is the Green Star Polyps Pachyclavularia (Briareum) violacea that also has a bright purple to reddish colored mat and very green, yellow or light green tentacles. Some experts treat these two genera as synonymous and eventually the Pachyclavularia genera may be reclassified as a member of the Briareidae family. However there appear to be some important differences, so it remains to be seen where they end up. Unlike the Pachyclavularia species, Briareum corals can form upright finger-like protrusions from their base while Pachyclavularia only seem to create folds in the mat. The Briareum corals from the Atlantic can resemble species from the Erythropodium genera, like the Encrusting Gorgonian E. caribaeorum. Although they are both encrusting gorgonians, however, they not closely related and there are some distinctions. The polyps of the Briareum corals reside in raised calyces or bumps on the surface while the Erythropodium species have a smooth surface. The Briareum species can also have short upright extensions arising from the mat which are mostly absent from the Erythropodium species. The most well known Atlantic species is the Corky Sea Finger B. asbestinum which will encrust and grow protrusions. The Pacific Encrusting Gorgonians are found in the Western Central Pacific with reported locations near New Caledonia, Palau, and the Philippines. These corals inhabit depths from between 0.5 to 131 feet (1 - 40 m), and are often found in just ankle deep water. The waters vary, having strong or weak water movement. The waters can also be very clean or very nutrient rich, and they can have varying amounts of lighting. They have relatively few nematocysts, so have lost the abilities to capture particulate foods from the water column. They relying instead on a mucus coating they produce to capture food particles. They will shed this mucus layer from their surface about every 10 days, depending on the amount of sediment and bacteria that has collected. Pacific Encrusting Gorgonians obtain other nutrients from the marine algae, zooxanthellae, which they have a symbiotic relationship with. Predators include the Flamingo Tongue Snails Cyphoma spp. that feed on a variety of gorgonians. The Pacific Encrusting Gorgonians are encrusting gorgonians that forms mats. They will cover over other corals, assuming their shape, but they prefer to take over gorgonians. Aside from that, they are not picky and will even encrust over loose rubble and rock. They can grow 2 to 4 inches (4-10 cm) per year and reach up to 3 1/4 feet in height (1 m). The rind of the Pacific Encrusting Gorgonian's mat is light tan to tan. The rind is dotted with slightly raised calyces that are more of a nub than a tube. 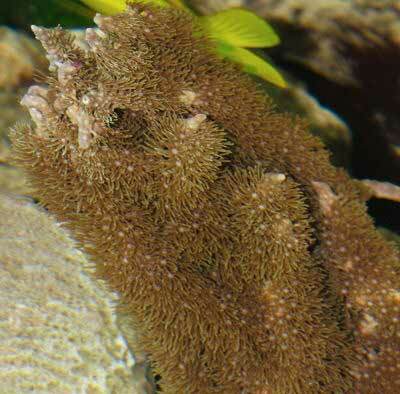 Long grass-like polyps extend out of the calyces giving them a "furry" appearance. The polyps are greenish with some tan at the base. The polyps are always expanded unless an outside stimuli disturbs them, then they can retract fully. The tentacles of the Pacific species are usually green, while they are brown in the Atlantic species. Sometimes the Briareum genus can be confused with other encrusting and mat polyp corals. The Pacific Encrusting Gorgonian resembles the True Star Polyps of the Pachyclavularia genera. However, the Pachyclavularia is generally distinguished by a brighter brighter purple to reddish color mat and very green, yellow or light green tentacles, while the Briareum species generally have a brown or tan base. Also, unlike the Pachyclavularia genus, they shed mucus "sheets." Size of organism - inches: 39.4 inches (100.00 cm) - They can reach up to 3 1/4 feet in height (1 m). The Briareum corals are moderately hardy and easy to care for, making them great for beginner aquarists. These are one of the most adaptive corals in the wild. Although they are photosynthetic, they need less light than many other corals. They are about as forgiving as any coral can get and still be considered symbiotic. Due to the seldom import of the Pacific Encrusting Gorgonians, it is more difficult than the more common corals to tell what optimal conditions are. It is speculated that because of their various depth and temperature tolerances, along with the coral having zooxanthellae, that it may be an easier gorgonian to care for. The Briareum corals have a high tolerance for both turbidity and a wide range of water movements. Provide a moderate, turbulent water flow. If the water flow is too slow they can succumb to cyanobacteria and algae. However if it is too strong, and especially with a more linear movement, it will interfere with polyp extension and the coral's ability to feed. They also need good lighting. In fact, the stronger the light, the faster they will grow. They grow most rapidly with moderate water movement and bright light. However, the Pacific Encrusting Gorgonian may spread and take over some corals, so it would be helpful to keep the colony on a rock that isn’t connected to the rest of the rock work. These corals make a wonderful candidate for those who want to try propagation techniques. In the wild, Pacific Encrusting Gorgonians have developed a couple feeding strategies. They capture microscopic food particles from the water column and can absorb dissolved organic matter. Their polyps do not feed on zooplankton, rather the Corky Sea Finger uses a mucus layer to catch particulates from the water column for part of its nutrition. They create this mucus cover over their surface and then about every 10 days, they will retract their polyps to allow the mucus to slough off. Unlike a lot of other Gorgonians, the Pacific Encrusting Gorgonian also has a symbiotic relationship with a marine algae known as zooxanthellae, where they also receive some of their nutrients. In captivity, the Pacific Encrusting Gorgonian will use light and their zooxanthellae for a food source, and will also create a mucus net to capture particulate matter. On a weekly basis, feed live enriched artemia nauplii and other similar sized plankton like foods. Stirring the substrate to suspend edible particulates is also helpful. along with the presence of fish, which can help provide nourishment as well. Diet Type: Omnivore - Nutrition is obtained from capturing phytoplankton and food particulates from the water column with a mucus net, and from the symbiotic marine algae, Zooxanthellae. Liquid Foods: Some of Diet - Marine snow and other phytoplankton preparations. Meaty Food: Some of Diet - Enriched artemia nauplii and other similar sized plankton like foods. Stable tank conditions are needed to keep the Pacific Encrusting Gorgonian and other members of the Briareum genus. Water changes of 10% biweekly or 20% a month is needed, although it is suggested that doing 10% water changes once a week will replenish many of the needed additives and help keep water conditions high. Iodine, calcium, strontium, and other trace elements can be added to maintain proper levels for good growth. Phosphates should be maintained as close to zero as possible and pH between 8.2 and 8.4. Magnesium Levels: 1,250.0 - 1,350.0 ppm - Magnesium makes calcium available, so if your calcium is low, check your magnesium levels before adding any more calcium. Iodine Levels: - May benefit from supplemental additions, dose per recommendation on label. The Pacific Encrusting Gorgonian can reach up to 3 1/4 feet in height and may need a tank to accommodate this eventual size. A tank that is at least 50 gallons and fairly tall, is needed to provide room for growth. A mature tank (well over a year old) is also advised to increase the successful life span of Briareum corals. A typical live rock/reef environment, along with some fish for organic matter production, is needed for your Pacific Encrusting Gorgonian to thrive. Provide proper lighting and water movement. They are highly adaptable to any lighting but will thrive best with bright lighting, Lighting can be provided with fluorescent like T5s, bright LEDs, or they can handle acclimation to Metal Halides as well. The water temperature needs to be kept lower than some corals, between 68° and 75°F (20° to 24° C). Provide stronger light in tanks over 30" deep. The Pacific Encrusting Gorgonian can grow rapidly, so it may be helpful to keep the colony on a rock that isn’t connected to any of the other rock work to keep them from spreading and taking over other corals. A sandy substrate is best since this coral will spread onto any hard surface, including rubble and possibly more stationary substrates like crushed coral. Placing them on a "rock island" surrounded by sand will help prevent their spreading to other hard surfaces and onto corals. Also stirring the sand bed, it releases nutrients into the water column that it can ingest. Water movement should be moderate and turbulent, but not to the point of stirring up sediment onto their mucus coat, since this will cause them to shed more often than normal. They produce a mucus sheet which they use for feeding. Every 10 days or so, they may slough off this mucus sheet to keep bacteria and sediment from collecting. If they are in more turbid water they will do this less often. However, too strong of a water movement, especially if it is linear rather than turbulent, will prevent proper mucus feeding ability. Low water movement will cause cyanobacteria and algae to overtake your Pacific Encrusting Gorgonian and will not allow proper polyp expansion. Minimum Tank Size: 50 gal (189 L) - A 50 gallon tank or larger, and tall. Live Rock Requirement: Typical Amount - Separate the colony from other rock work to help prevent them from spreading onto other corals. Substrate Type: Sand - Will not spread onto sand and uses nutrients from it when its stirred up. Lighting Needs: Moderate - normal lighting - Will grow faster in strong lighting. Temperature: 68.0 to 75.0° F (20.0 to 23.9° C) - Briareum species seem to need lower temperatures to stay healthy. Water Movement: Moderate - Moderate and turbulent. Water Region: Bottom - On a "rock island" in the sand. The Pacific Encrusting Gorgonian is very aggressive in that it will grow rapidly and encrust other corals. This genus needs to be contained, it prefers to take over gorgonians but will spread onto any hard surface. Putting it among the rock work will encourage growth onto the rocks and slowly over other corals. They can be put on the sand or a "rock island" with sand around it. Provide at least 4” or more of space between them and the main rock work, and they will stay put. Most fish will not bother this coral, however, Butterflyfish are known to feed on gorgonian polyps or tissue, so keep an eye on them. Some angelfish will also pick at the polyps, but can be housed with them if the angelfish is well fed. Other fish in the tank benefit the Pacific Encrusting Gorgonian in that they provide nutrients for the coral with their waste. Avoid the Flamingo Tongue Snails Cyphoma. which are readily available for purchase, since they will eat your gorgonian, and also avoid snails from the Murex genus. Mushroom Anemones - Corallimorphs: Monitor - May grow over and kill some species if given the opportunity. Leather Corals: Monitor - May overgrow and kill some species if given the opportunity. Zoanthids - Button Polyps, Sea Mats: Monitor - May grow over and kill some species if given the opportunity. Sponges, Tunicates: Threat - Will overgrow these if given the opportunity. Clams, Scallops, Oysters: Monitor - May grow over the shell area and irritate the species. Snails: Monitor - While most snails are safe, Murex genus snails and Flamingo Tongue snails will eat gorgonians. Sea Apples, Cucumbers: Monitor - Gorgonian may die if these animals expel their toxins. Nudibranch, Sea Slugs: Monitor - Should be safe, no way of knowing if any and all species are safe. Stony Corals: Threat - is aggressive - Will grow over and kill these if given the opportunity. Soft Corals: May be aggressive - May grow over and kill some species if given the opportunity. Although each colony is either male or female, there are no discernible sexual differences known. The Briareum genus has been propagated in captivity. The Pacific Encrusting Gorgonian most commonly reproduces asexually with pseudo-runner/stolon growth. Once the runner-like branches attach to the substrate and form a new colony, they will separate from the parent colony. They will also reproduce sexually, with developing planulae residing just beside the mouth and then releasing gametes into the water after 11 to 13 days. They are unique from other gorgonians in that some species will brood their young on the surface of the colony. There is no sexual reproduction yet reported in captivity. They can also reproduce through fragmentation. Propagation in captivity is easy as they can also reproduce through fragmentation. Simply cut off pieces of a branch or mat. Glue them to a rock or plug using cyanoacrylate glue, or attach them with a rubber band. You can also train them to spread onto rubble, which can then be easily snipped apart as needed. Some aquarists will take sheets of Briareum corals and attach them to objects in the tank that need some "disguising," like intake lines or overflow boxes. The Pacific Encrusting Gorgonian, as well as the entire Briareum genus, is hardy and very easy to care for. However they are susceptible to collecting detritus and to algae and cyanobacteria accumulating on its branches.They can get red band and black band infections that are caused by cyanobacteria. Keeping a moderate and turbulent water flow will help prevent this. If your gorgonian does get this, you can at times cut off the bad part and hope the rest will recover. Freshwater dips can also kill cyanobacteria, and are an effective treatment. The Briareum species may also be a food source for Flamingo Tongue Snails Cyphoma spp. and snails from the the Murex genus. Pacific Encrusting Gorgonians are not often found online or in stores. They may be sold under "star polyp" or Corky Sea Finger, which is a cousin of this gorgonian.